If you plan to take photos or videos underwater you need to find a camera which can easily cope with such a task. Waterproof cameras from our list are not afraid of rough mountain rivers or deep seas. 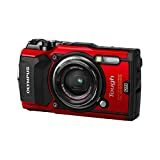 So, in case you’re one of those enthusiasts who are eager to capture the whole beauty of the underwater world then stick with us, as we have prepared a list of the best waterproof cameras you can buy today. A type of image sensor, as well as its size, affects the image quality greatly. So while selecting a camera pay attention to this feature. Note that bigger sensors provide better result. Even a 12MP camera can produce great photos in case its sensor is big enough. Lenses quality is important. Your task is to decide what types of lenses you need as all of them are suitable for different situations. Some waterproof cameras offer unique macro zoom. So if you aim at shooting underwater world in all its details then have a look at such cameras like Olympus Tough TG-5. Thanks to its microscope mode it is able to focus at the distance of only 1cm. Check whether a camera you are going to buy has an antireflective coating which allows easy shot review under the sun as well as underwater. The more autofocus points a camera has the sharper image it will deliver. Besides, pay attention to the shooting speed. The higher it is, the more chances you have to get clear images of fast-moving objects. All waterproof cameras can withstand different water depth. Look for one which is suitable for your purpose. What is more, don’t forget to check if its drop-proof, dustproof and shockproof. Some of the waterproof cameras are also freeze-proof. There is also a range of other features which should be checked before buying. They include video modes, scene modes, Wi-Fi, NFC, GPS and others. In a nutshell, any purchase requires a thorough study of camera options. This camera is one of the best budget items that won’t be scared by water, freezing cold and various falls. Olympus TG-5 can work in at a depth of 50 ft and withstand ruthless hiking in the mountains. What is more, this camera is shockproof from 7 ft and crushproof to 220 lbf. It’s also dustproof and is equipped with the anti-fog lens. Except for such protective features, Olympus TG-5 has a blazing-fast F2.0 lens due to which you can capture fast actions. It’s also great for 4K video shooting as it provides blur-free stills and doesn’t allow you to lose any details. Don’t be afraid of low light as well. This camera has a specialized image sensor and advanced dual quad-core TruePic VIII Processor that is responsible for decreased noise and increased dynamic range. Remember that Olympus TG-5 won’t get you lost as it is equipped with built-in action track sensors that include GPS for latitude and longitude, compass, a temperature sensor, and a manometer for altitude and water depth. This waterproof camera can be a perfect match for a real pro of the photography world. Leica XU is quite expensive as it costs around $3000, but if you aren’t a novice at this business then you will appreciate the whole spectrum of its capabilities. 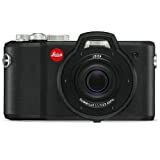 Leica XU (Typ 113) is a compact mirrorless camera of German production. It has a 16.3 megapixel APS-C CMOS sensor and ISO which can vary from 100 to 12,500. This model of Leica is not only waterproof but also shock- and dust-proof. It’s suitable for depths up to 50ft (15m) and up to 60-minute dives. Leica XU has 23mm F1.7 Summilux ASPH lens which is able to deliver the same angle of view as a 35mm lens of a full-frame camera. Leica lens can focus down to 20cm and delivers flash housing directly above the axis of the front element. This diminishes the distance between the flash and the subject what is essential for underwater shooting in order to reduce illumination. There is also an option of underwater mode which makes some changes in the white balance to adjust it to the peculiar conditions. All you need to do in order to activate this option is to press the UW button which can be easily found on the camera corpus. As Leica XU (Typ 113) was designed in collaboration with Audi Design, its top plate is made of high-grade aluminum and its body is coated with high-grip TPE armoring. Leica XU produces both RAW and JPEG files and its movie mode can record at 30 fps in 1080p HD resolution. This camera has conquered a title of the best waterproof camera for professionals thanks to its reliable and top-notch performance. Underwater monsters, wild rafting or colorful corals – Leica XU (Typ 113) is ready to face any task you have prepared for it. When searching for the best waterproof camera, sometimes you need to think outside the box. In this case, that means looking into action cams like the GoPro Hero 7. While it lacks a few features serious photographers will miss, it’s submersible up to 33 feet without a special housing. While the GoPro lineup is geared more towards video, it’s still a camera at heart. That means you’ll get a 12MP CMOS sensor and an automatic ISO range of 100 – 3200. It can take 30 photos per second in burst mode as well and has something called Super Photo. This mode applies HDR along with tone mapping and noise reduction to improve the overall quality of your photographs. The HERO7 is quite capable when it comes to video. You can shoot 4K video at 60 fps or bring the action to a crawl through Slo-Mo mode. As it’s the company’s top-tier camera, you’ll also get a 2” touchscreen display with zoom, GPS, and live streaming capabilities through Facebook Live. This high-tech action cam is ready to roll out of the box with several mounts and the appropriate accessories. If you’d like to kick things up a notch, several bundles are available including Adventure and Travel Kits. Its compact design is always attractive to travelers who need something reliable and at the same time small enough to put into their pockets. Actually, Nikon W300 deserves to be called one of the best waterproof cameras for different occasions. This camera is especially suitable for those who prefer extreme and action. It is 100 ft waterproof and freezeproof to 14° Fahrenheit. Besides, it can handle drops from 7.9 ft and it doesn’t allow dust to spoil shooting. Thanks to fast f/2.8 NIKKOR zoom lens Nikon W300 can freeze actions with all details saved. And note that poor light conditions won’t be a hindrance for high image quality. You will also enjoy its Macro Mode effect that allows you to reveal all the details of the world around you. There is an option of both 4K Ultra HD as well as 1080p Full HD videos that are provided with stereo sound. You can also edit your records using background music and special effects. Time-lapse recording and Superlapse video are included as well. Having a price of about $300 this waterproof camera impresses with a number of available options and their quality. Canon PowerShot D30 has everything you need to take a fine picture. PowerShot D30 has DIGIC 4 image sensor which together with 12.1 megapixel CMOS sensor creates Canon HS SYSTEM, which optimizes low-light performance and provides users with high-resolution images. 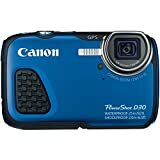 Canon PowerShot D30 is waterproof up to 82ft (25m) and is shock-proof – this camera can withstand drops from 6.5ft (2m) high. What is more, it is very resistant to temperature changes. Using a built-in GPS tracker you can also mark where and when your photos were taken. Canon PowerShot D30 has also got autofocus which allows shooting up-close objects. A built-in flash is available, too. It includes auto, on, slow synchro and off modes which save the sharpness of images and provide a necessary illumination. Obviously, white balance modes (auto, daylight, cloudy, tungsten, fluorescent, fluorescent H, underwater, etc. ), as well as scene modes (portrait, handheld night scene, monochrome, underwater, underwater macro, snow, etc. ), are also available. Besides, you can add some special effects such as sepia, vivid blue, black-and-white and others. Due to optical image stabilization, Canon shots will not suffer from blurring caused by camera vibration or its shaking. Note that you can also choose Smart Auto option which is able to select the proper camera settings automatically. The camera which can become a nice start for beginners is Olympus TG-870. It’s simple in use and has a good variety of options which will help a novice get acquainted with the main principles of photography including underwater shooting. So what does this waterproof camera offer? Firstly, it has a 16-megapixel 1/2.3 BSI-CMOS image sensor and TruePic VII image processor. Together they make it possible to shoot fine images even in low light. Note that its ISO sensitivity varies from 125 to 12,800, so it can adjust to different light conditions. Olympus TG-870 has a high-resolution LCD display with improved visibility in sunlight as well as underwater. What is more, it allows taking overhead and low-angle shots, and even selfies. By the by, there is a customized button on the front which can be used as a shutter release for hassle-free selfie shooting. Olympus TG-870 is dustproof and waterproof up to 50ft (15m). It is also freeze-proof up to -10°C and won’t be broken if dropped from 7ft (2.1m). Besides, this camera is crushproof up to 220lbf. As you can see this Olympus model is quite resistant to various external factors which can have a bad impact on its functioning. This is rather important for beginners who usually tend to nurse their new cameras. The other options to mention are Sportcam Modes with 4 video options, Nightscape Mode, 13 filters, GPS and Wi-Fi. Olympus TG-870 has also got an ultra-wide angle 21mm lens and 5x optical zoom. Ricoh WG-50 has a lot in common with the pre-cited Nikon W300. They have the same image sensor type and ISO range. Still, there are some features that differ and it’s not only about the price (as Ricoh WG-50 is quite cheaper than Nikon W300). If you prefer deep diving then Nikon W300 will be a better option for you as Ricoh WG-50 is only 46 ft waterproof. Still, it’s enough for amateurs who want to explore the underwater world of seas and oceans. Add to this enhanced digital microscope mode with 6 macro LEDs and you will get smooth images with perfect focus and even lighting. 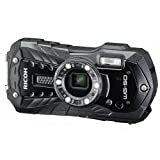 Apart from this, Ricoh WG-50 is shockproof as its ruggedized design protects from drops up to 5 ft. Unlike Nikon W300 this waterproof camera doesn’t support 4K video. Instead, it’s provided with 1080p HD at 30 fps. Fujifilm FinePix XP130 is one of the best waterproof cameras for action-hunters. It’s not only waterproof to 65 ft but also freezeproof to 14° Fahrenheit as well as shockproof to 5.8 ft and dustproof. And that’s for a bit more than $200. Apart from a durable build, this Fujifilm camera is equipped with internal 5x optical FUJINON zoom lens (28 – 140mm), which allows you to zoom right up to the action. There is also an option of Intelligent Digital Zoom. Such combination results in double zoom range. To make images smooth and accurate even under the most extreme conditions Fujifilm FinePix XP130 provides optical image stabilization. Besides, this waterproof camera has got an anti-reflective coating for easy use even on the sunniest day of the year. Note that the brightness is automatically adjusted in response to the lighting conditions. It’s one of the most compact waterproof cameras on our list, so if you need something really tiny and light then choose Sony DSCRX0. Though it’s not a budget camera it isn’t overpriced as well. Sony DSCRX0 has a unique stacked Exmor RS CMOS sensor with DRAM Chip that together with BIONZ X image processor produces high-quality images. By the by, thanks to stacked DRAM memory chip structure this camera has a fast readout and as a result advanced performance even in super slow motion mode. Sony DSCRX0 is waterproof to 33 ft and can withstand 6.5ft drops. Being 400 lbf crushproof and having its body made of duralumin this camera is durable and reliable under various unexpected conditions. Sony DSCRX0 is also a nice choice for super slow movies as it supports records at high frame rates up to 960/1000 fps. Due to its miniature dimensions and all-around versatility, Sony DSCRX0 can be used anywhere.